Mark your calenders! 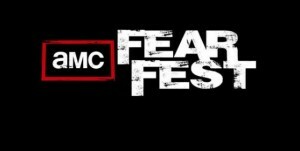 AMC has announced that FearFest will start on Sunday, October 18th 2015! The season premieres of “The Walking Dead” and “Talking Dead” will coincide with AMC’s Zombie Apocalypse Week, from Monday, October 5 through Sunday, October 11, as well as the network’s annual blockbuster marathon of thriller and horror films, AMC Fearfest. Celebrating its 19th year, AMC Fearfest will feature themed programming and more than 60 films, running from Sunday, October 18 through Saturday, October 31. So get ready for “Zombie Apocalypse Week” from October 5th-11th, “The Walking Dead” season six premiere October 11th and then “FearFest” from October 18th-31st. I don’t know about anyone else, but we are ready for October… NOW.